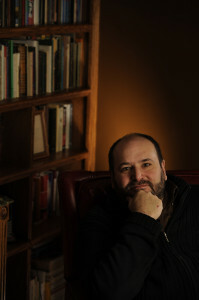 Gwydion Suilebhan earned his Master of Arts in poetry in 1993 from Johns Hopkins University, studying with Peter Sacks and John Irwin. As a member of the Writing Seminars, Suilebhan completed completing his thesis on Walt Whitman’s “Song of the Open Road” under the guidance of the late Allen Grossman. Earlier, in 1990, Suilebhan earned his Bachelor of Arts in poetry from Northwestern University, where he studied with Mary Kinzie, Alan Shapiro, and Reginald Gibbons. In 1989, he was invited to the New York State Writers Institute at Skidmore College, where he studied with Robert Pinsky and Richard Howard. After graduation, Suilebhan taught creative writing as an adjunct member of the faculty of the Maryland Institute, College of Art. From 2004 to 2006, he served as the founding poetry editor of Barrelhouse. In 2006, he participated in the Poetry Bus Tour.